What to talk about at the weekly team meeting? It’s a seventh-day conundrum. Yet again it’s Monday morning. Yet again it’s that darned team meeting, and yet again, as the person chairing it, you’ve got no idea what to talk about. Let’s just present the weekly team meeting with the same agenda as last week. Which, incidentally, would be the same agenda as the previous week’s team meeting, and the same agenda as the week before that. Ironic therefore when we complain that weekly team meetings are a non-achieving waste of time. Albert Einstein said the definition of insanity is doing the same thing over and over again while expecting different results. I’m going to suggest therefore that the vast majority of team meetings are a collective act of organisational mass-insanity that waste mind-blowing quantities of human hours every single week. To break free of the insanity you need to be ready to do things differently, and that’s what Broc Edwards’ new book “What thinks you?” is all about. While nominally a book about human resources, “What thinks you?” is actually a thought-a-day guide for leadership. It’s subjects meander through presenting, sales, e-commerce, customer services and all manner of behavioural and motivational topics. Articles take no longer than three minutes to read and celebrate in titles such as “Disengaging the Engaged“, “Tale of Two Burritos“, and the awesome “Punk Rock HR Worksluts“. Each little mini-article is an early morning croissant of ideas dunked in just enough fresh espresso to fire your enthusiasm. If your weekly team meetings don’t seem to achieve much beyond rehashing the same old agenda, then try making a weekly theme out of any of the 65 topics within the book. Introduce the theme at your next meeting and then ask your team to explore that topic over the coming week. It will get everybody talking, exploring, and engaged, and produce some organisational change as well. Doing things differently. That’s sanity. Just ask Einstein. 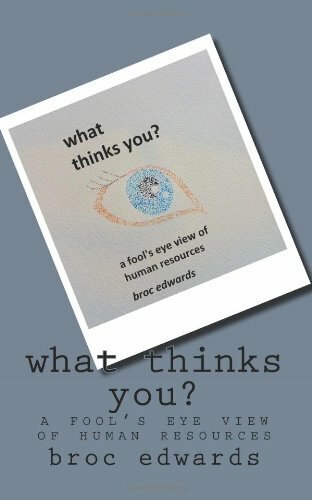 “What thinks you?” by Broc Edwards can be purchased from Amazon by clicking this link. that wold make a workplace like WordPress’ Weekly Photo and Weekly Writing Challenge- Totally anticipated and life swaying fun.